“You’re going to want to wear shoes that can get muddy.” That’s what Brian Klock of Klock Werks Kustom Cycles told me as we wrapped up breakfast in the lobby of the Holiday Inn Express in Tullahoma, Tennessee. That’s what signaled me to lace up my Chucks rather than my nice, leather Alpinestars riding shoes. I’m glad Brian gave me that tip because we had a rainy, muddy day ahead of us in Lynchburg. Having grown up in Brillion, Wisconsin with a population of 3,000, I thought I knew small town living. Then I went to Lynchburg, population: “about 700” according to the locals. Despite being such a small town in the middle of nowhere, Tennessee, there’s a good chance you’ve heard of it and there might even be a label or a t-shirt in your house that says “Lynchburg” on it. That’s because Lynchburg is home to the Jack Daniel’s distillery. Every drop of Jack Daniel’s Tennessee whiskey, the best-selling whiskey brand in the world, comes from this facility. I was invited there to take a VIP tour of the distillery, have a whiskey tasting facilitated by master distiller Jeff Arnett, and ride the Jack Daniel’s Limited Edition Jack Daniel’s Scout Bobber. I could wax poetic about the whole experience from beginning to end in which I saw pallets engulfed in flames to make charcoal, watched bourbon get filtered through said charcoal to become Tennessee whiskey, and visited the safe that killed Jack Daniel, but we’d be here for a while. You probably want to hear about the bike. 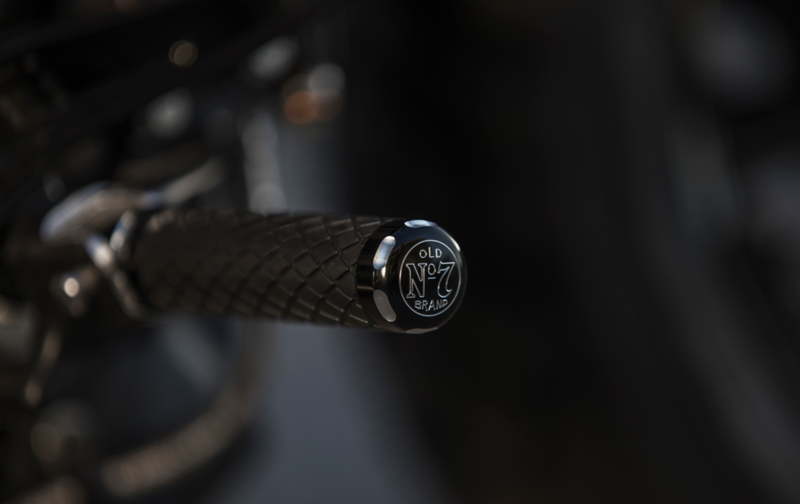 This isn’t the first time the two iconic American brands have collaborated on a motorcycle. This is the third consecutive year there’s been a Jack Daniel’s Scout Bobber Indian and the one that was selected this year for the Jack treatment was the Scout Bobber which came out last year. The two brands wanted it to be a more affordable offering than the previous projects to make it more accessible to the specific group of riders it’s been catered to: Firefighters and first responders. The other two Jack bikes had pretty general Jack Daniel’s themes. Black and white paint jobs, “Old No. 7” logos, filigree, the works. 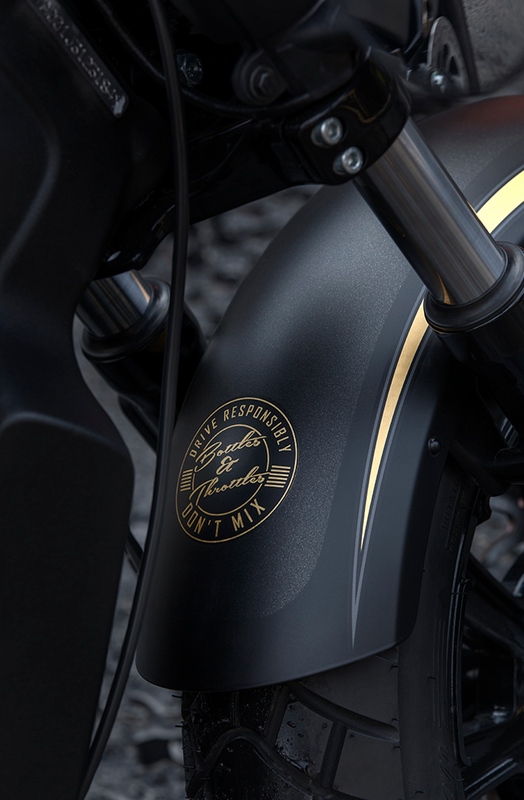 This Jack Daniel’s Scout Bobber has some of those elements, but this it is specifically themed off of the Jack Daniel’s Fire Brigade, which is a very real fire department of about 30 people just for the Jack Daniel’s distillery. When you’re dealing with that many dry ingredients in the Tennessee sun, a fire brigade is a necessity. 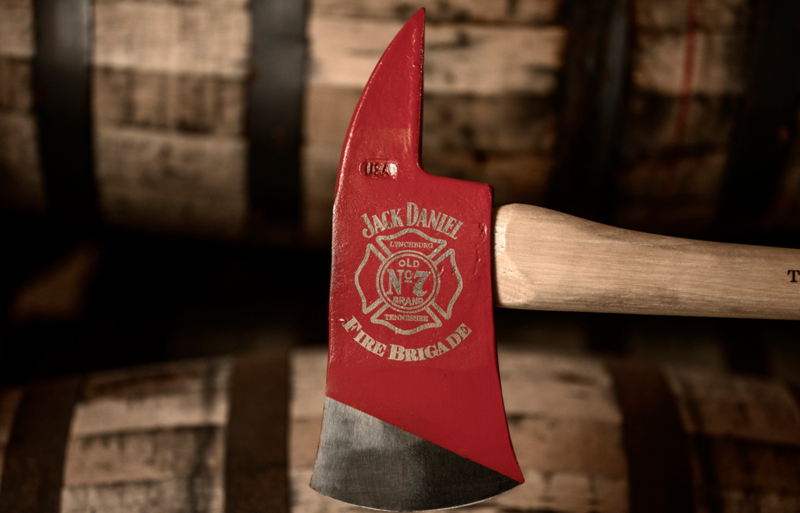 There’s a lot of pride in the Jack Daniel’s brand and just as much pride in the fire brigade associated with it. 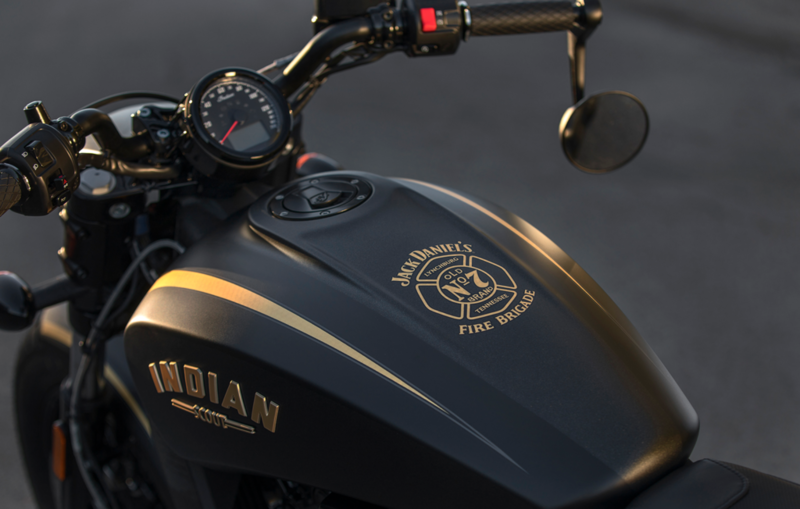 The brigade’s gorgeous Pierce fire truck is black and gold and so is this Indian Jack Daniel’s Scout Bobber. This, along with the previous Jack bikes, was customized by Brian Klock, who did a tremendous job making it really stand out while carrying a measure of subtlety. 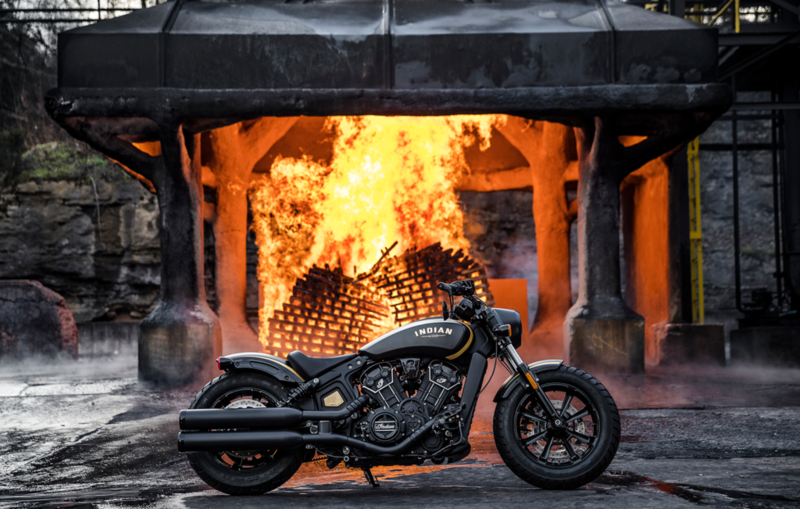 Anyone who has seen an Indian Scout Bobber will know that this one is special, but it isn’t too in-your-face with the Jack Daniel’s Fire Brigade theme. It’s two-tone matte black with gold stripes to match the fire truck. When I say “two-tone” I don’t mean black and gold, I mean there are two different tones of matte-black going on. It would be almost impossible to tell unless you’re up close to the bike in person, but when you do notice it, it’s very impressive. I don’t know what to call the pattern in the stripes, but it’s…fire trucky. The stripes have a sort of reflective checkerboard pattern and it’s a really nice touch. 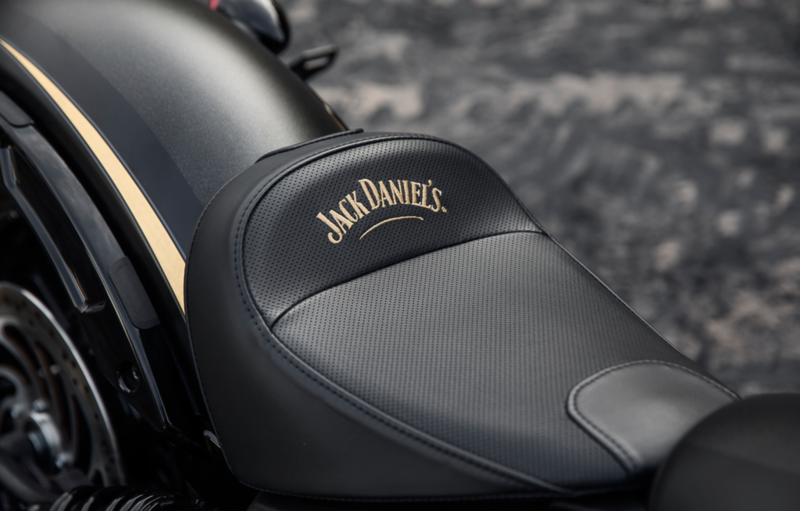 Other features exclusive to the Jack Daniel’s Limited Edition Scout Bobber is gold badging, “Old No. 7” end caps on the foot pegs, “Jack Daniel’s” stitched into the seat, a Fire Brigade logo on the tank, a numbered badge, and a reminder inscribed on the front fender that reads “Drive Responsibly: Bottles & Throttles Don’t Mix.” The gold graphics are real 24 karat gold and so is the coating on the individually numbered badge. The one they showed us was number seven of the 177 bike production run. Get it? Next articleMay Is Motorcycle is Motorcycle Awareness Month, But Do The CAGER’s Know This?